Beat high airfares - flexible arrival days are available at this property, as well as weekend and mini-week breaks! 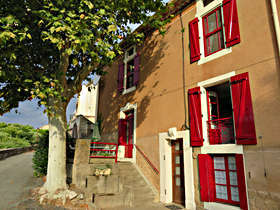 A turn of the century village house, conveniently located on the banks of the river Vernazobre in Saint-Chinian, offers perfect accommodation for up to six. Terrace for outdoor dining. Broadband internet access. The house is located towards the end of Quai de la Trivalle in Saint-Chinian overlooking the Vernazobres river and the hills in the distance. There is a free car parking space just outside the front door, next to the beautiful plane tree, which shades the house. All rooms are spacious, comfortably furnished and well equipped, and the house is within easy walking distance from shops, restaurants and swimming pools. On the ground floor is a utility room with shower, separate WC and washing machine. Climb the stairs with their original iron railings and decorative newel to the first floor. Here is the kitchen equipped with fridge/freezer, gas cooker, electric oven, microwave oven, electric kettle, coffee maker, toaster, dishwasher and double sink. The kitchen also retains its beautiful large marble sink and decorative fireplace! Next to the kitchen is the living room, which is comfortably furnished with sofa and easy chairs, a large bookcase with wide range of reading materials (for all ages) and games, and a CD player with IPod dock, as well as TV with satellite receiver and DVD player. Broadband internet access is available at the house, either via WiFi or Ethernet. From the living room French doors lead onto the terrace at the front of the house, which overlooks the river and the hills in the distance and is perfect for outdoor dining or relaxing with a book, watching the world go by. The road past the terrace is a culd-de-sac so there is next to no traffic. On the second floor are three bedrooms, two with double beds, another with a double and single bed. A cot is available on request. On this floor is also a spacious shower-room with shower, WC bidet and basin. All bedrooms are equipped with fly screens and the house has electric heaters throughout to make it comfortable during the winter months. There are beautiful views of the river, the waterfall upstream from the house, and the hills beyond, and LaRive is perfectly located for a relaxing and peaceful holiday.